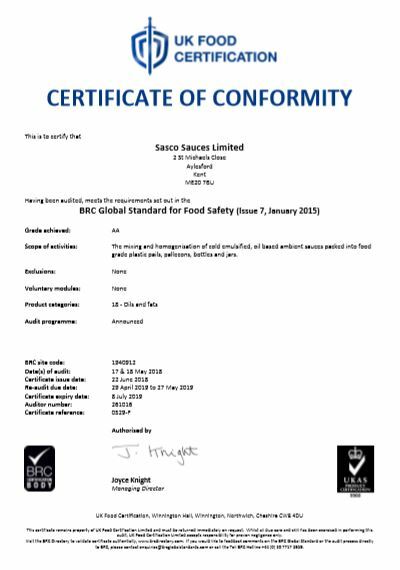 Sasco Sauces is an award winning manufacturer of mayonnaise and quality sauces produced to the highest standard at our purpose built factory, operating to BRC grade AA certification. Sasco Sauces is a privately owned company which has been manufacturing quality mayonnaise and bespoke recipe sauces for over 20 years. Our factory features excellent manufacturing and packaging systems which enables us to produce and deliver a range of sauces in a choice of quantities, varying from 1,000 Litre pallecons to 1 Litre jars. If you are looking for quality delicious sauces at competitive prices, take a look at our product list and contact us if you require samples and prices. In addition bespoke service is available, please feel free to contact us with any queries which you may have.